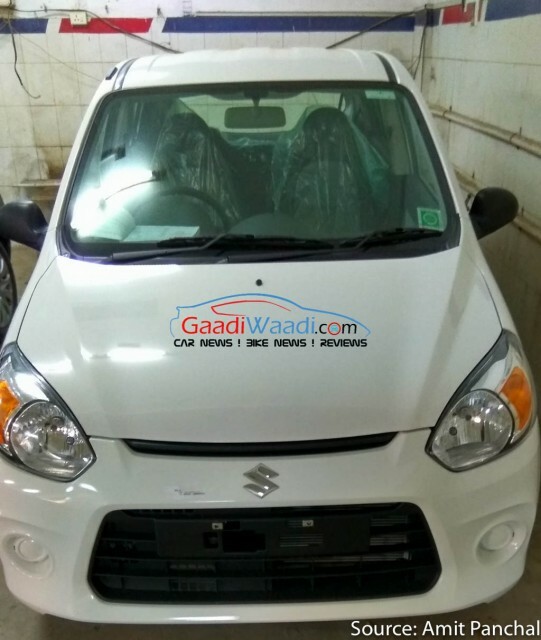 India’s largest selling car Maruti Alto 800 is getting its first facelift after its launch in 2012. The spy pictures of Alto 800 facelift have surfaced in the internet and show the car to be already in the dealer stockyard. Sources say the Alto 800 facelift will be launched in 2nd week of May. Inspite of its odd design Maruti Alto 800 continued the legacy of its predecessor, the legendary Maruti 800. Competitive price, low maintenance cost, peppy engine and being a Maruti made the new Alto 800 the largest selling car in India with over 25,000 cars sold a month. But the dominance of Alto 800 has a new challenge from Renault Kwid and soon to be launched Datsun Redi-go both aim to cut across Alto 800 sales. The Alto 800 facelift features a redesigned headlamp and bumper with broad hexagonal airdam. There is a slot for fog lamps as well which is missing in present alto. The rear features no changes and so do the interiors. Expect to get new fabric on the seats in the facelifted version. With Renault Kwid sales increasing and soon to be launch Datsun Redi-go aimed directly at Alto 800, a facelift was very much expected and Maruti is wisely launching the Alto 800 facelift before the official delivery of Datsun Redi-go which will happen in the first week of June. According to some random sources Maruti is developing a new Alto 800 model which will have better design elements than the current one. And the most interesting thing is it will come with a 2 cylinder diesel motor which was indeed need for the segment. Who else other than Maruti understands the Indian car market better?